A Georgia teenager is suing two of her classmates for creating a cruel Facebook page in her name after school officials and authorities said the matter was out of their control. Alex Boston, 14, of Acworth, Ga., was enjoying her school's Field Day celebration for the end of the school year in May 2011 when annoyed classmates began to approach her. "A little bit into the morning, her friends started coming up to her and saying, 'Why are you saying nasty things on Facebook about me?'" Alex's father Chris Boston told ABCNews.com. "She took off to the bathroom and hid," Boston said. "When she got home, she was crying." Alex told her parents what had happened and they sat down at their home computers to find the page. When they did, they were horrified by what they saw. Next to a distorted photo of Alex, it said that the languages she speaks were English and "Retardish." There were posts about false sexual exploits, links to racist videos on YouTube and implications of drug use. And the creators of the page were using the account to post insults on the pages of other friends. The "About Alex" section said, "I don't have many friends because I'm annoying and I poke people on my way to lunch so I get beat up a lot." "It made me feel horrible because I didn't think it would happen to me," Alex Boston told ABC News' Atlanta affiliate WSBTV. 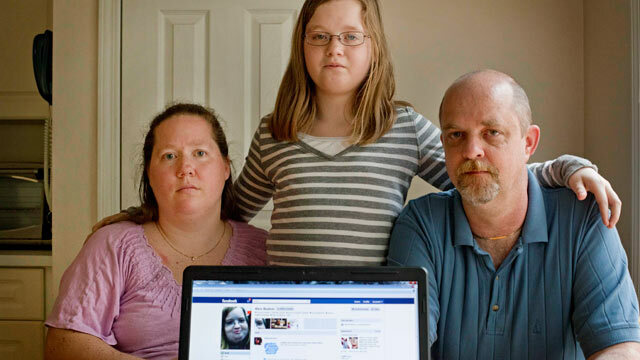 Alex had never been the victim of bullying before, and her family immediately took action. Their first stop was Alex's school, Palmer Middle School. Chris Boston said school officials spoke to the two teens that made the page and they admitted to making it, but the school could take no further action since the cyber bullying was done off school property, from the students' home computers. Meanwhile, they were repeatedly using Facebook's "report story or spam" function to try to get the page taken down, but it remained up. "For the first several months, she kind of went into a shell," Chris Boston said of his daughter. The family then went to the Cobb County Police Department to file an incident report. Police notes on the report said: "Boston was advised to notify "Facebook" and request that the web page be shut down. Report was requested and generated for documentation purposes only. No further action required." Most states, including Georgia, have laws against cyberbullying, but most of these laws do not cover bullying that occurs off of the school's campus. "[We were] ticked off," Chris Boston said. "It was very frustrating to sit there and see your kid go through this and you can't get it to stop." After all of the dead ends, the family sought legal help. Numerous lawyers turned down the case before Georgia attorneys Natalie Woodward and Corey Stern decided to meet with the family to hear their story. "It was impressive to me that [Alex] very much knew what the point of this was that it should not happen to any other kids," Woodward told ABCNews.com. "This is not the kind of case you retire on or get to go to college on. You're suing people who just have normal personal assets. She understood that and felt that it was important and worth doing." Woodward and Stern said that though the case did not have great financial benefit for anyone, they did not have the heart to turn Alex away after she and her parents had done everything right. "That would send the wrong message to hear and that would impact her forever," Woodward said. The Boston family filed a lawsuit against the two teenagers who created the page as well as their parents, who provided their Internet service and computers. When the school would not give the Boston family or their attorneys the parents' name or addresses of the defendants, the students had to be served the lawsuit at school. Woodward and Stern asked that the defendants not be named because they are under the age of 16 and have not yet responded to the lawsuit. They were served in April and have one month to respond to the suit. Woodward has not heard from the defendants' parents or any attorneys that may be representing them. The lawsuit claims that the defendant's actions were "intentional and malicious and were done for the purpose of causing Plaintiff to suffer humiliation, mental anguish, embarrassment and emotional and physical distress." It claims defamation and libel for the false statements and use of Alex's identity for the page. The Boston family is seeking a jury trial and punitive damages. In Georgia, plaintiffs do not determine the amount of monetary damages. That is determined by the court. "I was protective of Alex because I didn't want her entire eighth grade year to be spent in litigation with two of her classmates," Woodward said. "She really felt like it was something that they had a moral obligation to address and if it brought attention to the issue and kept some other kids from being upset, hurt or even committing suicide, then it was a moral obligation on their part to do it." The phoney page stayed up for nearly a year. It was not until after a television appearance by the Boston family last week that Facebook removed the page from the social media network. Though Boston said it took his daughter a long time to feel comfortable at school again, she is now doing much better and nearly back to her old self. "She's upbeat, having a good time and looking forward to summertime," he said.